Sharing Nature recently completed a major tour in China that went exceedingly well! Fifteen hundred enthusiastic nature educators attended our lectures and workshops. In 2000, Joseph Cornell first visited and introduced Sharing Nature to China, and it was a great joy to see how extensively Chinese outdoor and school educators have taken to and incorporated Sharing Nature into their teaching. Over 25,000 copies of Sharing Nature with Children were purchased in China in 2015. ​In Hong Kong, 350 leaders attended Joseph’s lecture, where the attendees were particularly interested in the meditative aspects of Sharing Nature and his book, The Sky and Earth Touched Me. 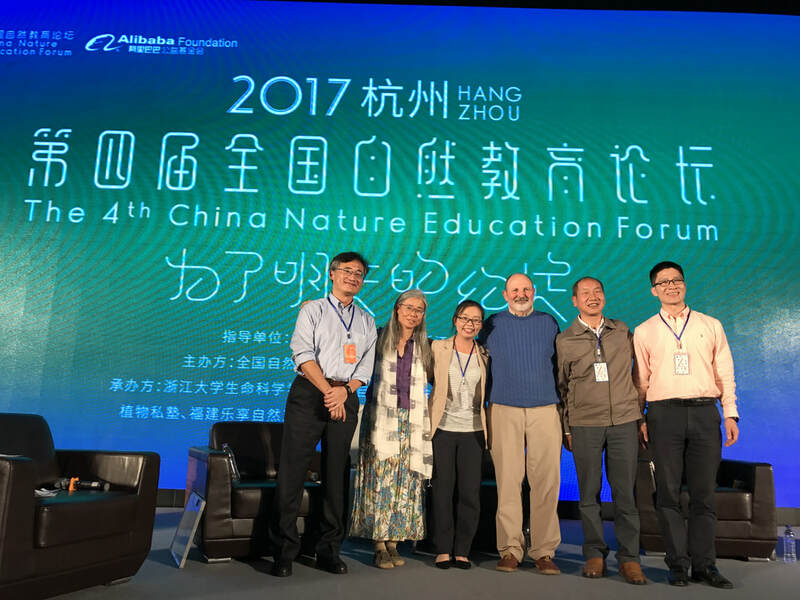 After giving a keynote lecture to 200 people at the Soong Ching Ling International Experience Center in Beijing, we met with 20 prominent environmental and school organizations and agencies that have been eagerly using Sharing Nature in their outreach, many of them on a national basis. As part of his talk, Joseph shared principles from his newly released book (in complex Chinese), Deep Nature Play: A Guide to Wholeness, Aliveness, Creativity, and Inspired Learning. The deep play principles promote a dynamic and holistic approach to learning and awareness. These principles were a huge hit everywhere we visited in China. Deep Nature Play will be released in the United States in January 2018. Stayed tuned! 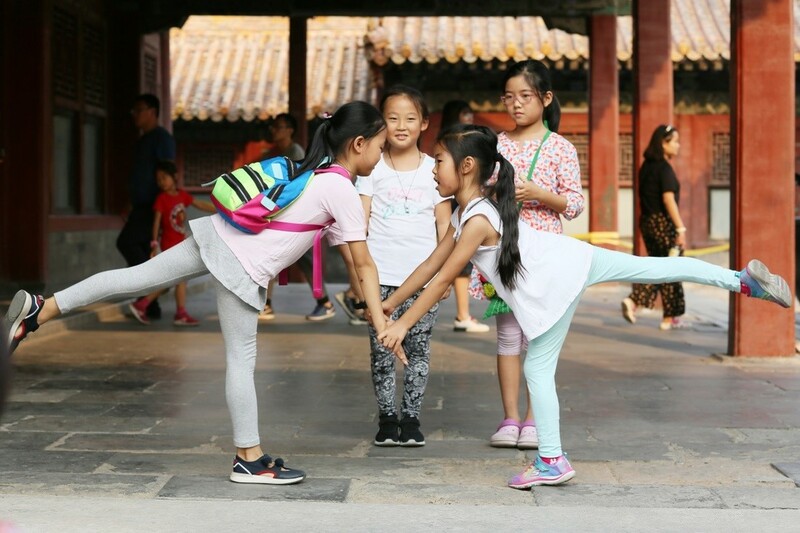 Linhong, Sharing Nature China’s leader, introduced a three-year national initiative, which will give in-depth training to 32 Sharing Nature leaders, who will then give regional Flow Learning workshops to elementary and secondary educators. The plan is to have thousands of Chinese teachers using Flow Learning in their classrooms. We set these realistic goals based on the overwhelming response and support for Sharing Nature in China. 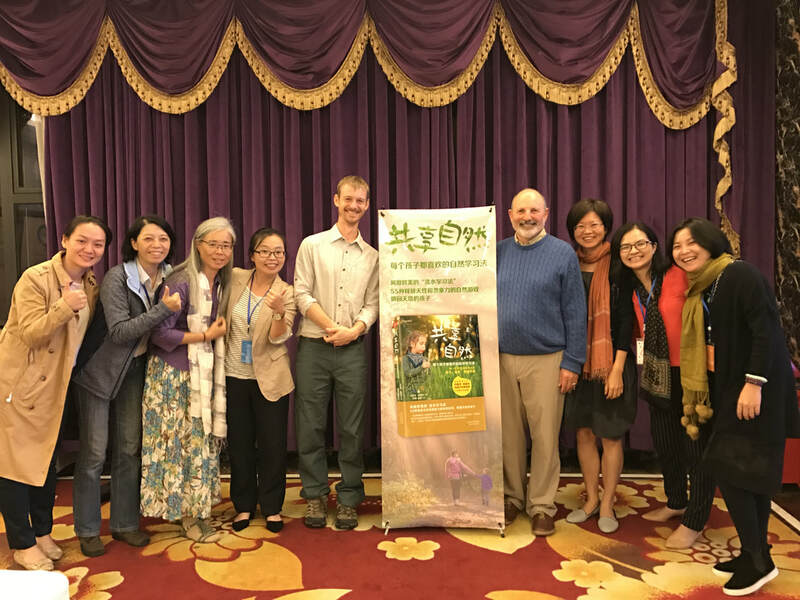 The staff of Sharing Nature China with Joseph Cornell and Greg Traymar with a poster of the upcoming Simplified Chinese translation of "Sharing Nature: Nature Awareness Activities for All Ages"